Includes fifty-five story cards, with audio on the CD. Dogs need lots of love, understanding, and attention – and that’s just the beginning! These cards share dog-care tips, which helps kids (and adults) have a happy life with their pet. Our Trading Cards feature stories “written” and “read aloud” by dogs – and since children relate well to animals, they can enjoy, while learning important lessons. Kids love the cards, and they serve as a useful tool for parents, caretakers, and educators. There are 55 lesson cards in this “Caring for your Dog” series that teach the basics of compassionate treatment and care of dogs. Dogs need lots of love, understanding, and attention – and that’s just the beginning! These cards share dog-care tips such as the importance of spay/neuter, socializing, keeping your dog safe and healthy . . . and more . . . This helps kids (and adults) have a happy life with their pet. 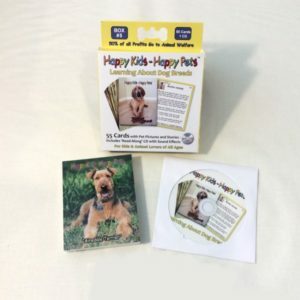 The front side of each card presents a precious, often funny, portrait of a dog and on the reverse side features a less than one minute “Read-A-Long Story Lesson” with an accompanying audio that can be found on the CD. 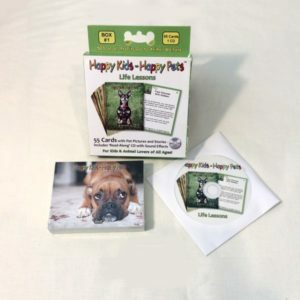 Kids can read the cards while following along with the audio or just listen while they look at the photo's of the dogs, either alone or with others. The messages truly come to life with wonderful sound effects. 16 “We Love To ________” – Pet play-dates. 33 “Betty Lou Says, ‘I Do Love My _______’” – Finding a _______ bed. 44 “No More _________ Puppies!” – Helping end puppy mills.